A very important place for the fostering and growth of the GAA ethos is obviously in the local primary school where children learn so much in their early years. In Tubber National School the GAA is seen as very important in the development of our children.Tubber has always fielded schools teams at under 11 and under 13 grades and with plenty of success also. 1998 saw two pieces of silverware brought to the school.The under 13 side won the Division 5 Schools Football Final and the under 11 team won the Bord Na Scoil Final.The under 13 side faced Clonmacnois in the Division 5 final which was played in Mucklagh. In a close fought game Tubber emerged winners on a score line of 2-4 to 0-4. Eddie Kavanagh was the captain that day.The under 11's beat Kilcormac in the Bord Na Scoil final in Ferbane on a score line of 1-3 to 0-4.The shield was presented to Captain Jonathan Rooney. The following year in 1999 there was disappointment when Tubber N.S. lost the under 11 final narrowly to Ballinamere.The year 2000 saw the under 11's once again beaten in the final by Ballinamere but the under 13's captured the Division 4 title when they defeated Durrow in the final. 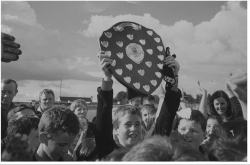 2001 saw the under 13's go on to win the Division 3 title at their first attempt.They played a tough Walsh Island team in the final but in a hard game they won out in the end. 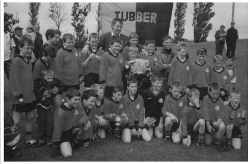 Yet more success was to come in 2002 when the under 13 side won the Division 4 title after they beat Cloneygowan in the final.Tubber N.S. did not reach another final until 2005 when they faced Ferbane in the under 11 Division 2 final which they went on to win. The 2007 under 13 final saw Tubber N.S. face Pullough in the final.They defeated Pullough and in the 2007 under 13 Harvest competition Tubber N.S. once again faced Pullough in the final. No doubt Pullough were looking for revenge but Tubber held out to do the double over them. However in the 2008 under 13 Harvest Final Pullough got the revenge they wanted when they beat Tubber in the final. In 2009 for the third straight year Pullough and Tubber went head to head in the under 13 Harvest Final. Once again Tubber emerged as winners to take their 10th school title in 11 years. St. Manchan's N.S. commenced on a hugely successful year in 2009, winning all their games in the group stages.This took them to the final where they defeated Coolnaharney in Walsh Island on a scoreline of 4-09 to 0-08. The school team continued their excellent run by winning the Autumn Competition, where again winning all group games and defeating Pullough in a thrilling final in Killeigh on a 6-08 to 4-07 scoreline.